This post contains major spoilers for Kong: Skull Island. After a 12-year slumber, the Eighth Wonder of the World has reemerged with helicopter-clobbering gusto in Kong: Skull Island. Now that the giant ape has been reintroduced to mayhem-hungry moviegoers, who pushed the worldwide opening weekend box office above $142 million, it’s safe to assume this won't be the last time we see Kong swinging through theaters. And if you hung around past the end credits of Skull Island, you got a none-too-subtle glimpse of what’s in store. There were plans to sequelize Kong even before Skull Island hit theaters. 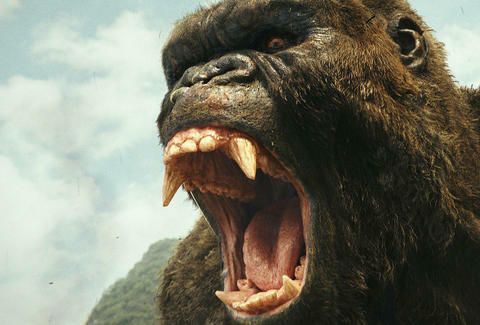 While the movie, from director Jordan Vogt-Roberts (The Kings of Summer), is the initial entry in Legendary Entertainment’s new King Kong franchise, it’s actually the second film in the company’s "MonsterVerse" series, which launched in 2014 with Godzilla. The current plan is to get these two overgrown monsters together for a big-screen title fight in Godzilla vs. Kong (scheduled for release on May 29, 2020), but before that, Legendary plans to expand the MonsterVerse in the tradition of Marvel comic book movies. On March 22, 2019, we'll get Godzilla: King of the Monsters – and we got our first taste of that movie in Kong: Skull Island's post-credit beat. Having withstood the wrath of Kong and all the other savage behemoths on Skull Island, Captain James Conrad (Tom Hiddleston) and photojournalist Mason Weaver (Brie Larson) find themselves in the clutches of Monarch, a clandestine government organization that tracks giant monster activity all over the planet (pretty much the best job ever). Monarch shows them an array of ancient cave etchings that suggest there are other gargantuan beasts roaming the Earth. 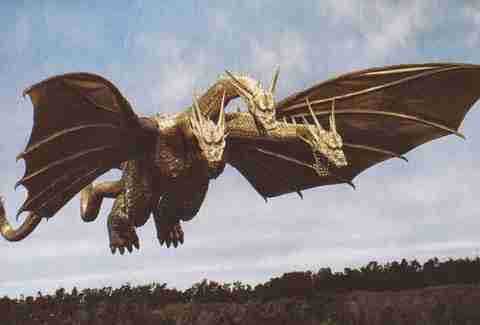 Specifically, Godzilla’s old foes (and sometimes friends) Rodan, Mothra and King Ghidorah. 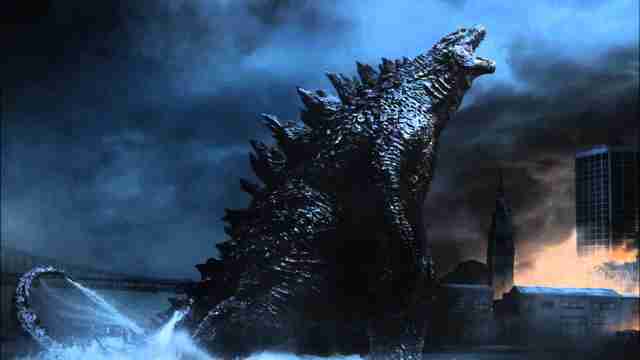 As the screen goes dark, Godzilla’s distinctive roar echoes throughout the theater. It’s about to go down. Though the film is still in preproduction, it’s fair to assume that Godzilla: King of the Monsters will feature the return of these three beloved kaiju (Japanese for “strange beast”). Under the direction of Michael Dougherty (co-writer of X2 and Superman Returns, and writer-director of Trick ‘r Treat and Krampus), this is shaping up to be a quasi-remake of 1964’s Ghidorah: The Three-Headed Monster, in which Godzilla, Mothra and Rodan set aside their city-smashing differences to defeat the titular menace. In that film, Ghidorah was new to the planet, having hatched from a crashed meteor; in Legendary’s MonsterVerse, it appears that the three-noggin terror arrived long before the advent of indoor plumbing. Will Mothra and Rodan do a heel turn and align with Ghidorah, or will more creatures join in for a kaiju battle royale à la 1968’s Destroy All Monsters? And how in the world will a 100-foot tall King Kong -- the tallest Kong in cinematic history -- throw a scare into the MonsterVerse’s 350-foot Godzilla? 1962's King Kong vs. Godzilla previously brought the titans together for a battle of equal stature. In the movie, a Japanese pharmaceutical company executive captures the big ape to help improve the ratings for his struggling television show. Kong, of course, escapes. As is the custom for a big monster visiting Japan, goes toe-to-toe with Godzilla. In the end, both monsters walk away, ready for future pictures. Our current Kong won't have it as easy. Imagine the 2020 fight looking something like a kaiju David and Goliath. Will Kong call in for backup from his Skull Island homies (provided there are any left after he dispatched the reptilian Skullcrawlers)? Will he even be up to the challenge with, presumably, an additional forty-seven years under his belt? Kong: Skull Island takes place in 1973. Legendary’s Godzilla franchise is currently set in the present day. As for rooting interest, the Kong-Godzilla fight will likely set the stage for a team-up against a far more powerful and nefarious villain. Perhaps the Skullcrawlers will form an alliance with King Ghidorah, or maybe Legendary will pull from Toho’s deep bench and bring in Baragon, Ebirah, Hedorah, Megalon or the dreaded Mechagodzilla. This is where the franchise success disparity comes into play: King Kong may be a cinematic icon, but, in any incarnation, he’s been unable to sustain a series beyond two films. 1933’s King Kong was immediately followed by the inferior Son of Kong, while Dino De Laurentiis’s 1976 remake only spawned the feeble, unasked-for King Kong Lives in 1986. Toho even gave the gorilla a second go after King Kong vs. Godzilla, but 1967’s awful King Kong Escapes decisively ended that run. Toho considered using Kong in Destroy All Monsters, but their license on the character was about to expire. In terms of established characters, Legendary is going to have to lean pretty heavily on Godzilla when it comes to populating the MonsterVerse. But this is a brave new world of giant monsters with a brand new set of rules and backstory. Maybe Mothra, Rodan and Ghidorah are a crucial part of Kong’s history as well. Regardless, here’s hoping this expanded universe continues to obey the directive of Ken Watanabe’s Dr. Ishiro Serizawa from 2014’s Godzilla: let them fight. Jeremy Smith is the author of George Clooney: Anatomy of an Actor and the forthcoming When It Was Cool. He lives in Los Angeles, CA near Bruce Dern.